Probably your must visit pub if stuck in Preston, Classic Victorian building, decent selection of ales on in good form, with a bar the perfect height for those people who like to lean on a bar. I can't find a listing for the nearby Black Bull though judging by comments and from my own visit it's probably unsurprising they have had it removed. 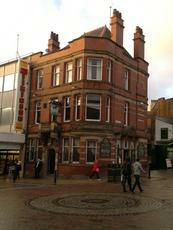 The last of the 4 pubs I wanted to tick in one evening in Preston and architecturally this is by far the best. This Robinsons pub sitting in the middle of the shopping area is absolutely stunning. Original Burmantoft tiled bar, a full mosaic tiled floor, stain glass windows, tiled half walls, snug seating areas, hall of mirrors seating area...this pub is chuffing beautiful. 8 hand pumps, 4 with Robinsons ales on, 3 guests and 1 spare pump. I start with a guest from Norwich’s Fat Cat Brewing Company Wild Cat @ 5.0% before moving onto Robinson’s Trooper, both ales are excellent but the Trooper is exceptional. The 2 bar man are very chatty and knowledgeable about their ales, the juke box is stacked with quality music and it great value at 4 tunes for a £1. I stayed for a few hours on Saturday (I was the last to leave), then went back for a couple more pints of Trooper on Sunday afternoon before my train home. Stunning interior, great ales, sharp service, perfect location this is another 10/10 for me...a proper bobby dazzler. This place is worth visiting even if it’s only to gaze in awe at the building (it’s Grade II listed) ! 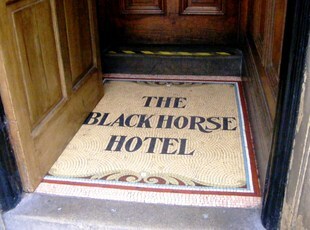 If you don’t marvel at the Victorian exterior, then you get some taste of what is to come when you see the pub’s name picked out in a tiled floor mosaic when you open the entrance door. The building is triangular shaped and there is a semi-circular central bar, again with tiled walls and floor. There are two rooms at the front with prints of old Preston and log fires, whilst at the rear is a “room of mirrors”. The clientele are decorous and welcoming. However, there is a downside. I’ll start by mentioning the piped music, which nobody was listening to. The place is a Robinsons tied house, and at my last visit there were 4 of their beers on tap plus 4 guests. Whilst this was an increase in numbers from previous visits, it was also a decrease in variety ! Old Tom was no longer available on tap, and all the guests were blonde / golden ales. I had Robinson’s Rouble Hop (IPA) which was admittedly very nice, but I could have killed for a stout or mild ! Building 10/10, beers 6/10 – I guess that makes it 8 overall ? Larger inside than I expected, and very pleasant. Friendly knowledgeable bar staff (although a request from a rather odd youth for "the blood of the leprechaun" was met with mystification - it was St. Patrick's day though). A very well-kept pint of 5% ABV stout from a new brewery in Southport - the name escapes me at the moment, but I had not seen it before - and there was plenty of other choice of ale including a house bitter. Very reasonably priced, too.